Oh goody! Actual knitting content to add to my blog! As the baby sleeps longer stretches through the night and I rely less and less on Nutella's nap to sleep myself, I have more time to knit. Over the holidays, I finished the baby blanket, and I even completed a second project! (Your computer does not, I repeat, does NOT have a virus...I really finished two projects!). I don't have a photo yet of the blanket, but I finished it while I was in California and went to my MIL's LYS, CloseKnit, in Riverside, to get a quick project. I found this Fiber Trends pattern for baby booties - which I have been wanting to try. The pair I made for Nutella were so cute - but totally unwearable because they always fell off! These have a tie, so I will report back to you whether they stay on better. These were made on size 4 dpns, using a washable acrylic that is new to me by King Cole called SmoothDK. If they stay on, this will definitely be a pattern to keep in the repertoire! Hi, I liked your post, was useful. I came across this post through a Google search and your post was relevant. Thanks. Check out this link http://mafiawarscheats.ratereviews.net/ I think that you might enjoy it. Lovely booties! and Lovely baby! So cute! 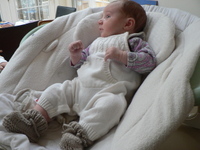 Those are fabulous little booties for a most wonderful baby!! Yay for the greatest blog ever...! Aw, such a sweetie, and sleeping enough to give mama some knitting time? Wow! The booties are adorable. What a lovely, non-pink color, too. Enjoy!